Leslie Bruning was born in Syracuse, KS and raised in Nebraska. He received a BA Degree in Art from Nebraska Wesleyan University in 1970, studied at Graz Center, Austria and earned an MFA Degree in Sculpture from Syracuse University in 1972. He served as Professor of Art in Bellevue University from 1973 to 2011. He is a founding member and a partner in the Hot Shops Art Center, Omaha, NE. 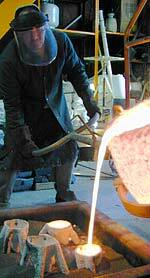 He is also the owner of Bruning Sculpture, Inc., a mold making, casting and fabrication studio that has artist clients across the country. He is a founding member of Omaha Creative Institute. Bruning is an active participant, advocate, and organizer of Public Art Projects. He was a member of the J. Doe Project in Omaha and created the J. Doe form. He was a participant in Chicago's Navy Pier exhibitions in 1998 and 1999, Omaha's 0! Art Project, and several other projects. Bruning has had over 40 solo shows, over 120 group or juried exhibitions, and completed more that forty sculpture commissions. He is represented in numerous collections across the country. 1990 Slide Presentation, International Sculpture Conference, Washington, D.C.
1998 WINGS, a brass hanging mobile 8' X 10' X 10', Bellevue University West, Omaha, Ne. 2003 Group Invitational, Fluxion Gallery, Omaha, NE. Created original forms of simplified six feet tall human figure for juried artists to modify and paint.